Key Housing, a top-rated corporate housing service for the San Jose area, is proud to announce their October, 2015, featured apartment community: Villa Torino. By selecting a featured apartment community in San Jose, Key Housing is helping those people looking for corporate housing to find quality housing in what is one of the tightest apartment markets in the United States: San Jose and surrounding Silicon Valley communities. The featured apartment community with San Jose corporate rentals for October, 2015, is Villa Torino. Interested parties can view the property San Jose rental properties on the website. It is located at 29 W Julian St., San Jose, California. To browse other available corporate housing please visit the website and view both locations, one can easily browse a plethora of available short-term housing for corporate renters available in the city. The value of real estate depends primarily on location, and the central location of Villa Torino, San Jose corporate housing which is situated right at the center of the city’s newly-vibrant downtown arts and entertainment district, is the perfect location that will add the most value to an urban dweller’s lifestyle. At Villa Torino, a great urban city-scape is just outside the front door. Meet up with friends at San Pedro Square for dinner. Or let out the inner chef and find fresh produce to create a dinner party at the weekly Farmers Market. Catch a show at the Center for the Performing Arts, cheer for the Sharks at SAP Center, and visit the Tech Museum. In the summer, head one block over to Plaza de Cesar Chavez for free music in the park. 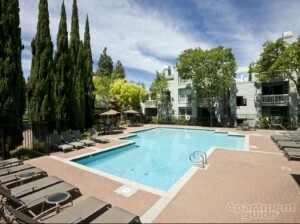 Life at Villa Torino, the premier San Jose corporate housing, is in the center of it all. Availability for corporate renters cannot be guaranteed; however, Key Housing has many other available opportunities in the hot San Jose and Bay Area rental market. Interested parties are recommended to either use the website, or contact Key Housing directly for personal assistance with their San Jose temporary housing needs. Based in Folsom, California, Key Housing Connections Inc. specializes in corporate housing and corporate housing in large cities like San Francisco, Los Angeles or San Diego as well as smaller cities like Menlo Park or Fremont, California. Key Housing is a leader in affordable, friendly, short-term and corporate housing housing in places like Eureka or Chico, and just about every city in California. Whether it’s serviced apartments or a furnished rental, just search, click or call today! This entry was posted in Corporate Housing, Press Releases, Short Term Rentals and tagged Corporate Housing, San Jose, San Jose Short Term Rental, Short Term Rental on October 1, 2015 by Lee McDonald.